If you live in Dallas, you are well aware that allergens are causing havoc throughout the metro. We enjoy a relatively nice climate, but the downside is that various plants bloom throughout the year and trigger seasonal allergies. 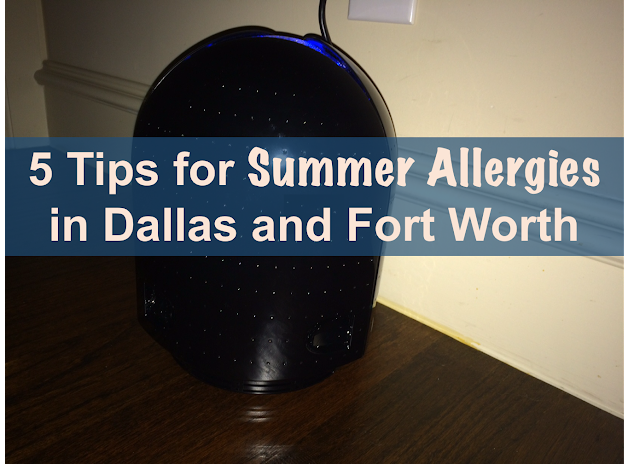 As a fellow Texan in the DFW metro, let me share 5 allergy tips that have helped our family. 2. Use an air purifier with good reviews that fits your space. "Airfree air purifiers are effective against bacteria, viruses, mildew, mold, dust mite allergens, pet allergens, pollen, and tobacco odors. SGS, the world's leading inspection, verification, testing, and certification company, and dozens of other international laboratories have proved the effectiveness of Airfree air purifiers at reducing the amount of microorganisms and harmful substances from the air. The TSS technology used is an exclusive and patented technology used in Airfree’s air purifiers, is established in over 50 countries worldwide, and is completely silent. With no fans or turbines, a good night’s sleep is guaranteed. Only Airfree combines high efficiency with an award-winning design that beautifully complements the appearance of your home. Airfree air purifiers do not require any maintenance or replacement parts and generate no waste. There is no need to change filters or moving parts. It uses less energy than a 60w light bulb, is easy to transport, weighs less than 5 lb, and takes up very little space. Airfree’s exclusive technology works by eliminating microorganisms and allergens, destroying them in a fraction of a second. Depending on the model, between 4,000 and 6,000 gallons of air pass through the Airfree device every hour, treating all the air in the room in a very short space of time. The process works in much the same way as sterilizing water by boiling it; when water is boiled, the microorganisms it contains are eliminated. In similar fashion, Airfree continually draws in air, heating it to over 390ºF and instantly sterilizing it. The purified air is then cooled inside the device before being returned to the room. The entire process is completely silent and requires no maintenance, not even the occasional replacement of parts. All you have to do is switch the device on and leave it to get on with the job. All tests performed on the Airfree air purifiers are available on their website." Personally, this air purifier has been great for us here in Dallas. As a long term allergy sufferer, I am grateful to the Airfree engineers that designed this air purifier because they seem to be perfectionists. This air purifier has been quiet, effective, and low maintenance for us. We literally pulled it out of the box, removed the plastic, and plugged it in. It's a self contained purchase since it doesn't require us to replace any filters. It works like a dream. I couldn't be happier! Life has to go on despite allergies. Personally, I have to drive places even if I have allergies. Running the a/c in my car helps because this filters the air in the car.